Militiamen have killed more than 100 people in an attack in southern Sudan in the latest in a series of ethnic clashes, the military says. 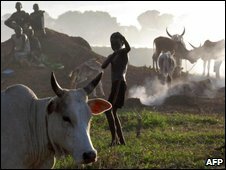 UN sources said thousands of armed men from the Lou Nuer ethnic group attacked civilians and security forces in the village of Duk Padiet in Jonglei state. Last month about 185 Lou Nuers were killed by ethnic Murle fighters in an attack in the same state. Some 2,000 people have died in similar clashes across the south this year. Initial reports of Sunday's attack on the village had a much lower death toll. Major General Kuol Diem Kuol told the BBC a nearby company from the Sudan People's Liberation Army (SPLA) had been able to retake the village. He said the attackers had targeted the military and that 22 of the dead were soldiers, including the major commanding the unit. "This is not a raid for cattle but a militia attack against security forces," he said. The United Nations mission in Sudan said it was aware of the incident, but did not have full details about it yet. Under a 2005 peace deal ending a two-decade war between north and south, former southern rebels formed a power-sharing government with President Omar al-Bashir's party in Khartoum. Mayen Ngor, the commissioner of surrounding Duk County, said the attack had been part of a campaign against that peace deal. He told Reuters news agency that 260 huts had been burned down along with the police station and local government buildings. Thousands of people had fled, he said. A national election is due next year and southern Sudanese are meant to vote in a referendum to decide whether to secede from the north in 2011. The BBC's Peter Martell in the southern Sudanese capital Juba says many people fear that Khartoum is orchestrating the violence. Some southern politicians believe the government is arming militias from both sides in an attempt to destabilise the region and delay the votes indefinitely. But the south is made up of a patchwork of rival ethnic groups who have long fought over grazing land, cattle and other resources. Khartoum vehemently denies playing any part in the violence in the south.